Rent a larger cottage, in Parry Sound, Ontario, Canada. lakeside vacation self-catering cottage for rent in Parry Sound, Ontario, on Oastler Lake. 2 1/4 hours north of Toronto. Sauna, fire place, fire pit. ATV Tours, and Tours by Air and Boat on Georgian Bay. Additional tourist information and maps are at the cottage. 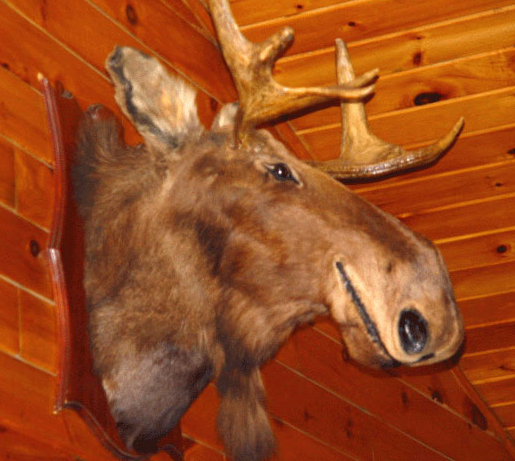 The Smilin' Moose Lodge offers 2 living rooms, 2 full fridges. Cottage privacy on 2.56 acres of beautifully varied land (lawn, beach, forest) with 422 ft of waterfront. Very private, yet 5 minutes from shops, hospital, Georgian Bay. for you to explore & enjoy. Beds - 4 Queens (8); 1 Double(2); 1 Bunkbed(2). Also available, 1 Playpen. Good bedding supplied. 1 shower/tub and one shower. Towels supplied. The Dining Area, which seats 8 at an oak table, is open concept to the Living Room. coffee maker, toaster oven, microwave, stove, blender and four slice toaster. It has a table that seats 4(6), and is open to the Dining and Living Rooms. a 3 pc bathroom, laundry room and a sitting area. and swim/beach/boat accessories like noodles, life jackets, and inflatable water & toys. vaulted ceiling and it's own ensuite bathroom with an old soaker tub. awesome view of the lake and sky, day or night. child's cot bed for any little ones who would like to sleep close to mom and dad. There is also a portable playpen. a table for game playing, and a cast iron stove. a Stereo and some CD's. This is a very cosy yet spacious room. It has vaulted ceilings and is entirely pine. Outside, this accommodation features many natural land formations everywhere to enjoy. Canadian Maples, Birch and Pine trees. make the deck comfortable for your entire family. where you can swim, or simply relax while the kids play. perfect for game playing or lounging. Horseshoes, volleyball, croquet, badminton and other lawn games are supplied. almost right to the water. rocky outlook over 'Moose Meadow'. A walk along the driveway is pleasant as well. This cottage is family oriented, but not exclusive to families. 2 people can enjoy it as much as 12 people. make your vacation relaxing, enjoyable, and one to remember. Many beautiful holiday rentals Canada directly by owner. List your vacation rental free of charge. Lots of fantastic vacation rentals Canada by owner. Fast and easy booking.